This themed picture frame is textured with the look and feel of an actual soccer ball. 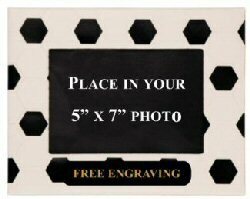 Display your 5 inch x 7 inch photo with a free engraved black name plate. Soccer picture frame can stand or hang horizontally or vertically.